I can’t decide whether this pudding is closer to a no-bake cheesecake or a ganache tart made with mascarpone instead of double cream. Either way, this is such an easy pudding to make yet it looks and tastes like a dish that has involved much skill and effort. 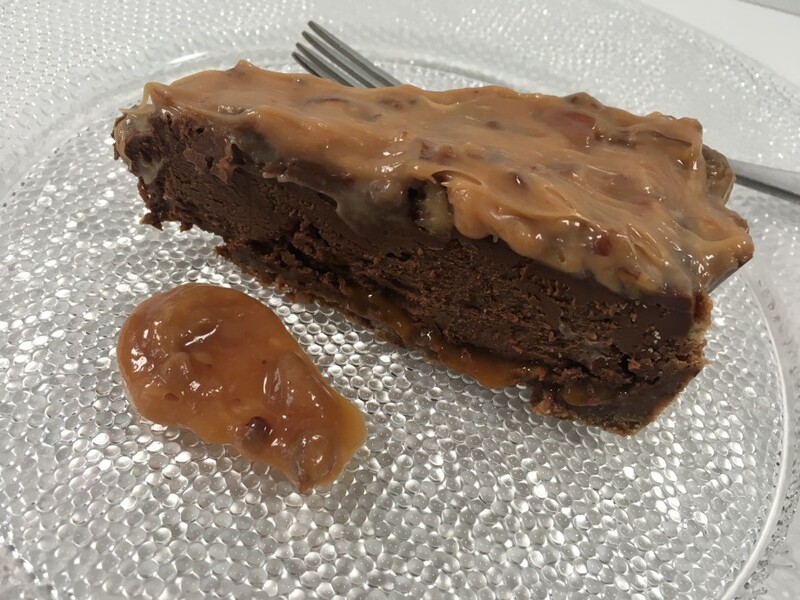 You could make life even simpler by buying a salted caramel sauce for the topping. 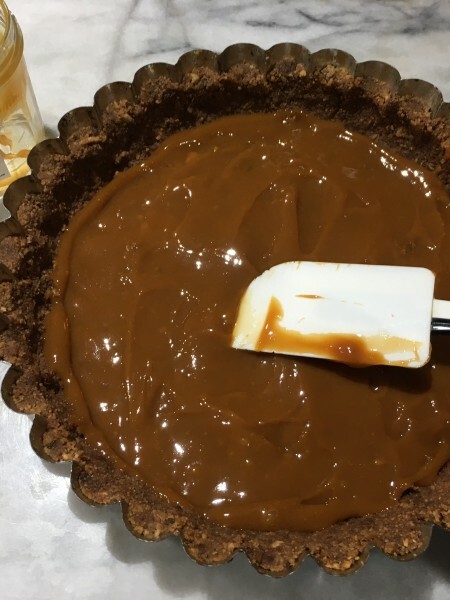 It might seem odd that I specify a shop-bought salted caramel (or you could use Carnation caramel and add some salt to taste) for the base layer but they are much thicker than a homemade version and won’t ooze uncontrollably. If you haven’t got a deep tart tin I suggest you use a spring-form cake tin although it is slightly more difficult to line as the sides are straight rather than sloped. Put the crushed biscuits in a bowl and stir in the melted butter. 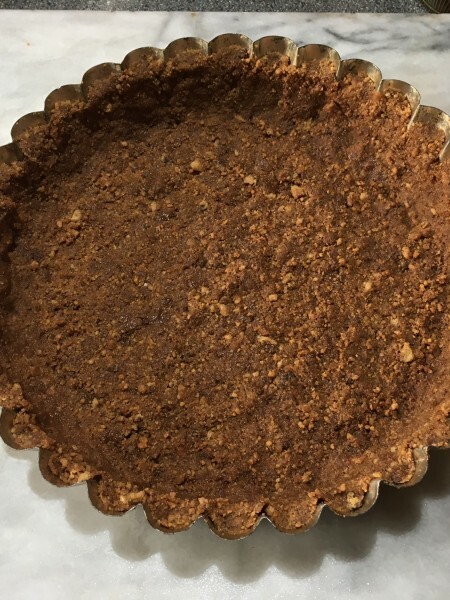 Make sure all the crumbs are well coated then spoon the buttery crumbs into a 22cm, 5cm deep fluted tart tin- (see intro). Spread the crumbs evenly over the base and up the sides of the tin, packing them down firmly. Chill for at least 30 minutes. 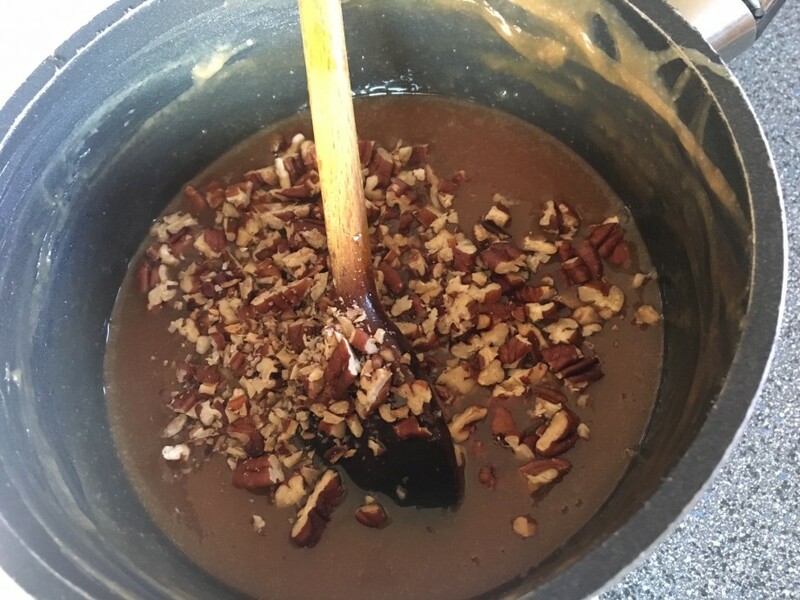 Put the chocolate, golden syrup and 4 tablespoons water (if you like you could add some rum instead) into a pudding basin and place it over a saucepan filled with about 2cm barely simmering water. Stir from time to time until the chocolate has melted. Take the pudding basin off the heat and leave to cool for about 10 minutes. If the chocolate is too hot it’ll “seize” -i.e. solidify- when it comes into contact with the mascarpone. Put the mascarpone in a bowl and beat a little to loosen it. Gradually beat in the cooled melted chocolate until the mixture is smooth. 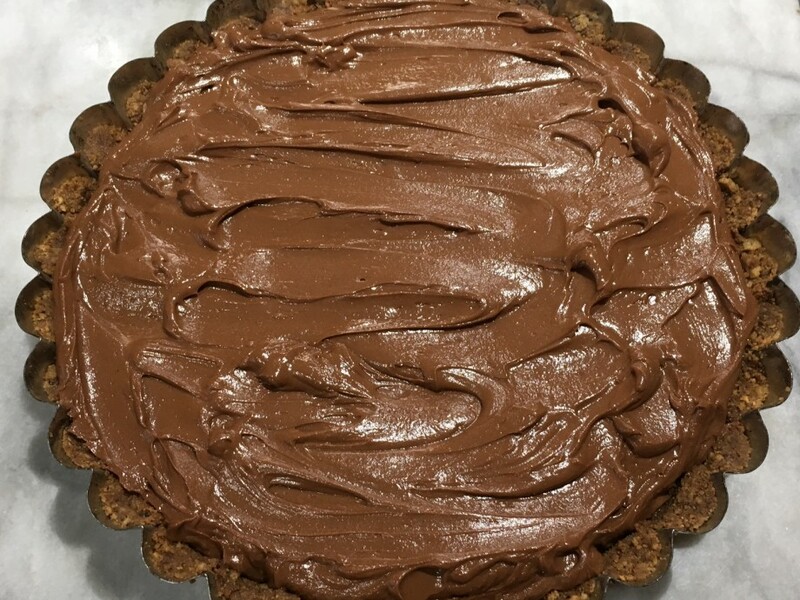 Spread the base of the tart with the contents of the jar of salted caramel. Spoon over the chocolate mascarpone mixture and spread out to the edges. Chill for 3-4 hours. For the topping, heat the oven to 180˚c, fan oven 160˚, mark 4. Spread the pecans on a small baking tray and cook in the oven for about 6-8 minutes until evenly toasted. Leave to cool then finely chop. Put the sugar in a saucepan with 55ml water and dissolve over a low heat. When the liquid is clear and all the sugar has dissolved, bring up to the boil-without stirring. Let the liquid boil until it turns a deep golden brown. You can swirl the pan around to ensure the sugar caramelizes evenly. Immediately take off the heat and pour in the cream. Leave for a few minutes then stir gently. Put the pan back on a low heat and stir until the caramel is smooth and any lumps have dissolved. Stir in the chopped pecans and leave to cool. Remove the tart from the tin and place on a serving plate. When the sauce has reached room temperature pour over the tart and serve immediately.